President Donald Trump on Wednesday took more of a "what-me-worry" tack on the special counsel's probe into Russian election meddling and possible White House obstruction of investigators. "We will see what the report says. Let's see if it's fair," the president told reporters, after months of decrying a "witch hunt." Only last week, however, he called it "illegal" and even said "there should be no Mueller report." Trump cautioned it's up to Attorney General William Barr whether the report goes to the public to see. "I have no idea when it's going to be released," he said, but added: "Let it come out, let people see it." Past vows of transparency from Trump proved false. He said he'd "absolutely" disclose his income tax filings if he ran, then kept them secret. He said he wanted to be interviewed by special counsel Robert Mueller, then didn't allow it. Due to presidential protections, evidence about Trump could be included in the confidential report to the attorney general but not made public. No matter what, the conclusion of the investigation will have the Democratic-led House of Representatives taking fresh looks based on even an outline of Mueller's conclusions. This week, Judiciary Committee Chairman Jerry Nadler (D-Manhattan) warned of resistance if the White House makes claims of executive privilege. Part of Trump's remarks sounded like a conspiracy theory wrapped in a non sequitur: "It's interesting that a man gets appointed by a deputy, he writes a report, uh, you know, never figured that one out. Man gets appointed by a deputy, he writes a report." Over the past 21 months, Mueller's investigation revealed instances of people around Trump seeking Russian help to benefit him either personally or politically. Of six people charged who were connected to Trump, five have been convicted or pleaded guilty. Meanwhile, Reuters cited signs as of last week that all the investigative and prosecutorial work had not been completed. 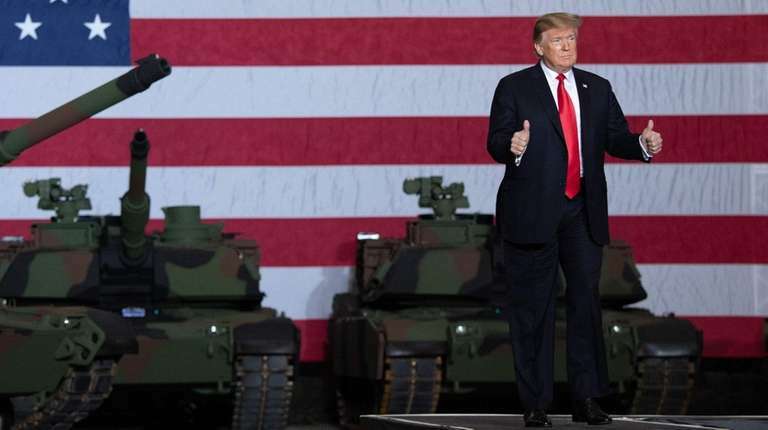 Trump chose a very strange locale — an Ohio plant that builds tanks — to resume his obsessive attacks on the late Sen. John McCain, which are chilling fellow elected Republicans, as Newsday's Tom Brune and Laura Figueroa Hernandez report. Visiting the state that proved crucial to his 2016 win, the president on Wednesday claimed a restoration in American manufacturing. But he also said McCain “didn’t get the job done for our great vets in the VA.” More spitefully, Trump complained that he authorized "the kind of funeral [McCain] wanted" but was not thanked. The crowd, including members of the military, remained largely silent during the riff. Meghan McCain called the remarks about her late father a "bizarre new low." Trump once called the Electoral College “a disaster.” Now he defends its “brilliance” — since it gave him his 2016 win despite losing the popular vote to Hillary Clinton, Newsday's Figueroa reports. Sen. Liz Warren of Massachusetts and ex-Rep. Beto O'Rourke of Texas, both Democratic presidential candidates, have expressed support for abolishing the Electoral College in favor of direct voting for president. Trump called this and other reform proposals from the opposing party "strange." The Pentagon's inspector general is investigating complaints that acting Defense Secretary Patrick Shanahan boosted his former employer, Boeing, and degraded its military-contractor competitors. The Federal Reserve left interest rates unchanged as it expressed increasing concern about slowing economic growth. Stocks fell after Trump warned he might leave China tariffs in place for a "substantial period." Trump blasted surrogate Kellyanne Conway's husband, who says the president is mentally sick. George Conway says Trump's attacking him as a "loser" proves the point. Joe Biden has overseas fans of his own for a presidential run. Trump used a fringe-group-spread viral video from two years ago to attack the Transportation Security Administration — without noting he is in charge of it. TSA is part of the Department of Homeland Security. Felix Sater, a longtime Long Islander and former Trump business associate who pushed the defunct Moscow hotel deal, is due to appear next Wednesday before the House Judiciary Committee.